Energy company Cuadrilla has begun drilling for oil at a site in West Sussex after being held up by more than a week of protests. 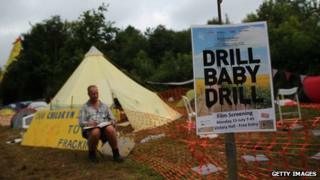 The company said it started drilling in Balcombe at 11:15 BST after completing tests on the equipment. Protesters have gathered outside the site for the ninth day and more lorries have gone through the gates. 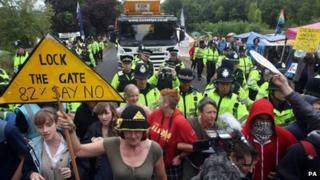 Campaigners fear the test drilling could lead to hydraulic fracturing, also known as fracking, at the site. On Friday, two protesters were arrested on suspicion of assaulting police as tensions continued. Sussex Police allege an officer was punched and kicked by a woman who announced she was 14, but turned out to be a 19-year-old from Portsmouth. A 22-year-old man from Bexhill was also arrested after a police officer was hit in the face with a placard, officers claimed. Both were being held in custody. Six people were arrested on Thursday after protesters blocked the site entrance with an antique fire engine. Cuadrilla spokesman Matt Lambert said the company had made good progress in getting lorries delivering drilling equipment on to the woodland site. "We have had a significant amount of disruption from protesters and the police have been dealing with that in the proper way," he said. "They have a perfect right to make their point of view known." More than 30 people have been arrested since last Friday, mainly on suspicion of obstructing deliveries, including the daughter of Kinks star Ray Davies and Pretenders singer Chrissie Hynde. Natalie Hynde, 30, glued herself to her boyfriend, veteran environmental activist Simon "Sitting Bull" Medhurst, 55, to form a "human lock" at the site entrance on Wednesday. Human rights activist Bianca Jagger has called on people across the UK to join protesters. Vanessa Vine, from Frack Free Sussex, said any future fracking would be "a violation of our geology that could threaten our water, fresh air and our children". Another protester, Kathryn McWhirter, from the No Fracking in Balcombe Society, added: "It is of huge national importance that we all stand up against this dangerous coalition of the petro-chemical industry with our government." Friends of the Earth spokeswoman Brenda Pollack said: "It threatens their environment and quality of life and will mean more climate-changing emissions are pumped into the atmosphere. "And there's plenty of evidence that it won't lead to cheaper fuel bills." 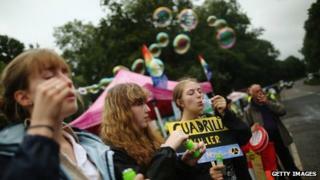 Cuadrilla has said it would need fresh permission to carry out fracking. Chief executive Francis Egan said he did not think the community would be disrupted once drilling began. "The community should not really notice much activity at all unless they want to walk down to the site and see it," he said. "There will not be a lot of noise. "The testing does involve some flaring if there is gas but we are not expecting to find gas." 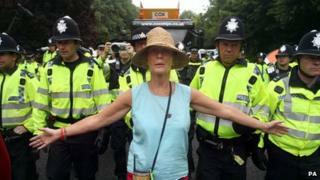 Is Balcombe fracking's first stumble in the South?